Have you ever experienced water damage in your home? We all know that any level and type of residential water damage is destructive. If it is your first time, this post will help a bit. There are things that you should know before planning to clean and dry out your wet carpet yourself. After experiencing water damage from internal or external causes, most homeowners naturally wish for making things back to normal as soon as possible; unfortunately it can lead to doing mistakes. First, you should aware that the process of Water Damage Carpet Drying is not as simple as it might seem. Therefore homeowners must know which type of water damage that they still can think to handle the wet carpet drying out by themselves–for whatever reason. You can identify what you are dealing with based on three categories of incursion below. Each category determines the different procedures on how the water damage should be treated and recovered. Category One: The cause is clean water that free of pollutants such as waste and urine. The water comes from fresh sources that might include pipe joints, water heater, steam lines, basins or even rain water. The fluid should look and smell like tap water –it is the basic rule. Category Two: The cause is gray water that has some small pollution. It might come from domestic equipment (other than toilets) such as washing machines, dish cleaners and bathrooms with pee. Category Three: The cause is black water that comes from unclean resources such as toilets with waste, sewer lines or standing water that may already contain bacteria. Water types in the Category Two and Three offer health risks to the whole occupants in the residence. You should avoid handling the incursion of those types of water yourself. For your family’s health and safety, recovering from the water damage that caused by Category Two water, Category Three water or heavy flooding should be handled by Institute of Inspection Cleaning and Restoration Certification (IICRC)-certified professionals that equipped with the latest technology, skills and knowledge. Let’s say that you face a ceiling leak that affects a part of your carpet floor during heavy rain. In this case, you deal with the water damage from clean water or Category One incursion in a small affected area. 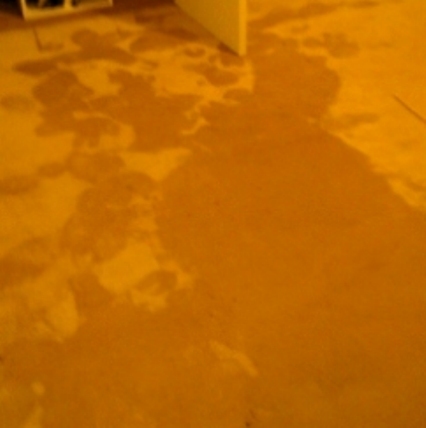 It is a type and level of water damage that still safe for you to dry and clean the wet carpet yourself. Make sure to act fast to avoid getting wetter. Don’t abandon the damp carpet more than 48 hours as it might attract mold and bacteria to grow along with bad smell to come out. The faster, the better. Pull away the wet part of the carpet and dry it. Go online and visit trusted resource sites such as Wikihow to know more details about how to dry water damaged carpet yourself. Follow the steps and utilize the required electrical devices such as fan, dehumidifier, air conditioner, vacuum cleaner and steam cleaner that available in your home. If you are in a big doubt with the result, not sure the carpet is already dry and clean totally or still dirty and damp inside, it would be better to contact and get help of the local experts that offer wet carpet drying service. Keeping unclean carpet will only put your family’s health in high risk! When it comes to bigger dry out and water removal, don’t ever think to do it yourself. It is already an emergency situation that only can be restored by professionals at reputable Water Damage Restoration Company. Better safe than sorry, right?